This volume models a 21st century supply chain: one that uses technology that leads to the power of the individual, not larger organizations. Author Jack Buffington explains how in the near future, each of us will be a "prosumer" in a peer-based economy of micro-level manufacturing with little waste and infinite customization. There are two primary schools of thought in regard to the world economy of the future; from one side is a belief that economic growth can continue in perpetuity, driven upon a cheap and plentiful energy supply. From the other point of view is a perspective that economic growth will soon end has due to a lack of cheap and plentiful oil, too much financial debt, and a damaged environment that cannot withstand more growth. Frictionless Markets proposes a third way: a 21st century model based upon an economic calculus that does assume that fossil fuels are rapidly depleting and the environment is being damaged, but does not assume that this means an end to growth, but rather, a beginning of opportunities. 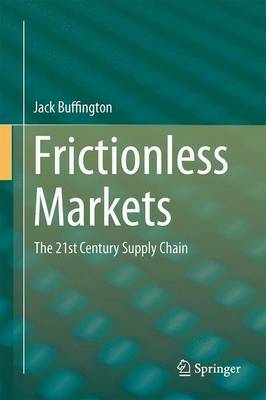 Frictionless Markets tells the story of why and how frictionless markets will exist by the year 2030. Dr. Jack Buffington is both a supply chain professional for one of the largest consumer products companies in the world, and a researcher in biotechnology and supply chain at the Royal Institute of Technology in Stockholm, Sweden.